Alle Jahre wieder... Every year's the same... This phrase is what many Germans think about when it comes to Christmas. Soon there will be a Christmas market in almost every city in Germany. There will be a lot of bric-à-brac for the Christmas tree next to mulled wine, gingerbread and other goodies. We put here some sources what is quite typical for Christmas in the Germany. Get inspired and get involved by Christmas delicacies and crafts, visit a Christmas market and enjoy the festive mood. From the 1st. day of Advent* there is a Christmas market in nearly all German cities, ranging in size and atmosphere from one to two stalls in small town and villages, decorated with pine branches and lanterns, to the commercial excitement and consciously cultivated magical atmosphere that surrounds the big markets in major cities. These have been an essential part of Advent in Germany for centuries and each year local inhabitants as well as visitors enjoy the traditional atmosphere with friends and family. Some have almost become fairs in their own right with accompaniment of festive music, Christmas plays, "Glühwein", "Lebkuchen" and other warm and sweet things, and - last but not least - the presence of St. Nicholas. * explanations of Christmas-related days see further down. The Christmas market originated in Dresden. Since 1434, when the duke first allowed a meet market the day before Christmas Eve, people have been able to buy their "Festtagsbraten". Over the years artisans joined the market and people short of money have used the market to earn a little extra with their home-made handicrafts. In 1471 the city of Dresden distributed "Stollen" (=Striezel), a special Christmas cake, to poor people for the first time. In that time nobody could have thought that this Christmas market and the tradition of making "Stollen" would ever turn out to be so popular with millions of people and travellers' now visiting the various Christmas markets. This is really something special: standing quietly with a cup of warming "Glühwein" (mulled wine) in your hand looking over the Christmas market and absorbing the uniquely festive atmosphere. Stuttgart: one of the oldest, biggest and most atmospheric markets in Europe stuttgarter-weihnachtsmarkt.de. In Bamberg there are also beautiful, romantic Christmas markets (weihnachtsstadt.bamberg.de). The largest is located on the market square close to the town hall and not far from the language school TreffPunkt. Regularly the language students meet there to taste the different varieties of mulled wine and other delicacies. Those who would like to have more information and links to other markets might have a look at www.weihnachtsmaerkte-in-deutschland.de/ (in German). It is a pity that from December 24 all Christmas markets are gone for almost a year. But there is some consolation: In Rothenburg o.d.T. a Christmas market is open throughout the year: www.wohlfahrt.de. There, even in summer when nobody in Germany is thinking about Christmas, you can find everything which is fashionable for the upcoming Christmas season: candles, fairy lights, wreaths, Christmas tree decorations and everything you can think that is related to Christmas. German Christmas Museum: Also located in Rothenburg o.d.T. and run by Käthe Wohlfahrt, this is a permanent exhibition in Germany covering the history of German Christmas traditions. The museum is made up of 11 rooms, each displaying a different feature including Christmas history, Advent calender, nutcrackers etc. Contact: German Christmas Museum, Herrngasse 1, 91541 Rothenburg, www.weihnachtsmuseum.de. Advent marks the beginning of the build-up to Christmas, starting on the first Sunday after 26 November. It begins with quiet contemplative days in November, but excitement and activity increase as Christmas approaches, accompanied by the usual shopping, preparation of special food and Advent celebrations. The Advent Wreath (Adentskranz) is a very popular decoration in German homes. It consists of a circular wreath of pine-branches with four candles on it. On the first Sunday in Advent , the first candle on the wreath is lit, two candles are lit on the second, three on the third and four on the fourth Sunday, immediately prior to Christmas. For children the highlight of Advent is St. Nicholas' Day (Nikolaustag) on 6 December. Originally children left hay and straw for St. Nicholas' horses but now they simply put a shoe or a boot outside their bedroom door, window or by the fireplace on the evening 5 December, hoping to find it full of sweets, biscuits, nuts and fruit the next morning. Christmas Eve (der heilige Abend, literally the "Holy Evening") is the climax of the German Christmas. Shops and offices close at mid-day or 1pm, and most people spend the afternoon at home in preparation for the later celebrations. The tree is decorated with straw stars, foil and glass decorations, apples, gilded nuts, ring biscuits, Lebkuchen (spicy biscuits), chocolate or marzipan decorations, wooden angels, pine cones, tinsel and wax candles or electric lights. Presents are placed either under the tree, with the crib if there is one, or else on the present table (Gabentisch). When everything is prepared, normally just after dark, a little bell is rung as a signal that the children may come in to see the lighted tree and receive their presents (die Bescherung). Before the exchange of gifts takes place, the Christmas story is often read by the light of the candles and favourite Christmas carols are sung. Depending on whether the family is Roman Catholic or Protestant they will probably go to church at midnight or in the late afternoon, if they have children. The rest of the evening is enjoyed as a family get-together. The children play with the new toys and all chartering of the Christmas goodies. Since the Middle Ages carp has been a traditional food for the evening meal on Christmas Eve. All kinds of food are eaten nowadays on Christmas Eve evening, but the traditional Christmas food mentioned in the St. Nicholas rhyme, apples and nuts and almonds (in the form of marzipan) still remain favourite Christmas nibbles. December 25th is known as the "First day of Christmas" (der erste Weihnachtsfeiertag) and, in comparison with 24th December, is a quiet day, often spent either visiting or being visited by relatives. Goose is still widely served for the main meal, but is by no means as obligatory a Christmas dinner as e.g. turkey in Britain. December 26th, the "Second day of Christmas" (der zweite Weihnachtsfeiertag) also known as St. Stephan's Day, has much the same function as the day before, being a public holiday and a day of family reunions or outings. "Practical note": If you want to travel through Germany on these days it is as well to bear in mind that from 23rd December all streets are extremely busy, especially the motorways. e.g. 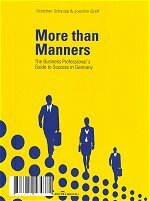 with the chapter "Celebrating at work in Germany" - Showing recognition or carelessness? >>> For intensive German training: Take part in our German classes in Germany.